Need fast, affordable and actionable research among your target audience? Digsite Sprints quickly identify your target consumers and let you collaborate with them to develop products or marketing programs. Choose the Digsite Sprint that's right for you and your timeline and be confident you are using a proven research approach. Get the Iterative Insights you need - in as little as one day. 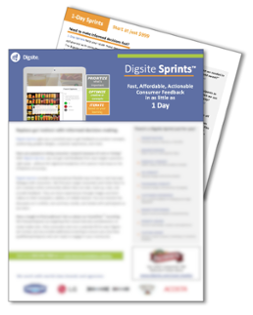 Download the Sprints Fact Sheet to see how Digsite Sprints can help you propel your business forward!